Now imagine that, rather then sitting in front of a computer screen or whatever it is that you do, you were to spend those ten hours running, cycling and swimming. Sounds good? Well it certainly does for a group of athletes who, for the past year, have been gearing up to take part in the Karnten Ironman in Austria. In reality, the word ironman does very little to describe the sheer difficulty of this sport. For ironman, which is an extended version of triathlon, consists of a 3.86 km swim, a 180.25 km bike ride and a full marathon run, raced in that order and without a break. The very best athletes, can complete this in around eight hours; for the rest it can take up to fifteen hours. Or, to use the previous example, if they set off as soon as you wake up they would still be at it by the time you’re getting ready to go to sleep. For most of us, that seems like sheer madness yet for those who want to push their bodies to extremes it is something that they have to do. Despite having won countless national triathlon championships, Galea is still in his mid-twenties and an athlete who is still to reach the peak of his physical abilities. He is also one who you get the feeling love a physical challenge. Little wonder then that, the Austria ironman will be his fourth. 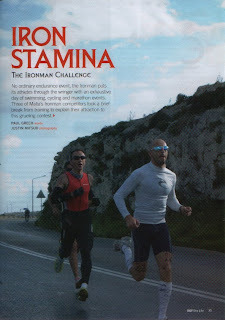 Galea is the one who has spearheaded the recent increase in the number of athletes interested in the ironman distances. With over 2,500 athletes being expected to turn out for the Karnten ironman, the Maltese will be but a drop in the ocean. Similarly, with the possible exception of Dermot Galea, none of them are going with any hopes of finishing high up the ranking. Yet, as you would imagine for such a tough event, training over the past months has been intensive. “Ironman preparation is not just about physical endurance training,” Spiteri confirms. Learning about herself and her limits is certainly what attracted Donatelle Callus, one of two women in the group, to ironman. As, in reality, is any sort of finish to the ironman challenge. This article appeared in the July 2009 issue of Skylife magazine.